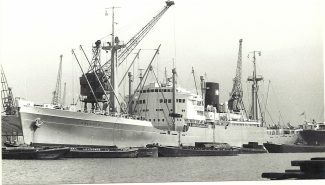 Cargo vessel LANGNOEAS in Tilbury about 1971. No more details RWJ. Thanks for the information RWJ and yes I do have all the 2/6 ABC books . An occasional visitor to Tilbury docks was the motor vessel LANGKOEAS (built 1949; 9270 tons gross), which was built for Rotterdam Lloyd Line of the Netherlands. Rotterdam Lloyd was one of the traditional Dutch companies that provided a service to Indonesia (formerly Dutch East Indies), but its share of trade declined following that country’s independence. 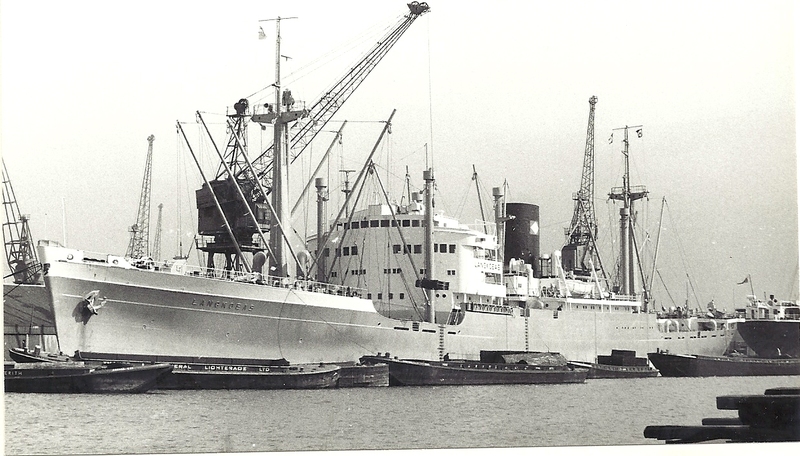 LANGKOEAS was sold in 1968 to a Panama-registered company and the ship changed to Liberian flag. It was operated from the Amsterdam office of a new-ish Indonesian company, Trikora Lloyd. In 1973 the vessel hoisted the Indonesian flag under the ownership of Trikora Lloyd and continued with them for eleven years before it was broken up in Bangladesh. In this photograph, the vessel has the funnel markings of Trikora Lloyd, but was probably in Tilbury some time during 1968-73. As for its previous life, JW, you will find the ship listed in one of the Ian Allan books on “Foreign Ocean Liners” … assuming you still have your copies.